Archimedes (287-212). Engineer dan ahli matematika sekaligus filsuf yang berasal dari Syracuse.Kutipan: Archimedes tewas ketika pengepungan Syrakuscuse when he was killed by a Roman soldier despite orders that he should not be harmed. Cicero describes visiting the tomb of Archimedes, which was surmounted by a sphere inscribed within a cylinder. Archimedes had proven that the sphere has two thirds of the volume and surface area of the cylinder (including the bases of the latter), and regarded this as the greatest of his mathematical achievements. Unlike his inventions, the mathematical writings of Archimedes were little known in antiquity. Mathematicians from Alexandria read and quoted him, but the first comprehensive compilation was not made until c. 530 AD by Isidore of Miletus, while commentaries on the works of Archimedes written by Eutocius in the sixth century AD opened them to wider readership for the first time. The relatively few copies of Archimedes’ written work that survived through the Middle Ages were an influential source of ideas for scientists during the Renaissance, while the discovery in 1906 of previously unknown works by Archimedes in the Archimedes Palimpsest has provided new insights into how he obtained mathematical results. art decoArt Deco adalah sebuah aliran/paham desain yang populer dari 1920 hingga 1939, yang berpengaruh pada seni dekoratif seperti arsitektur, desain industri, maupun seni visual seperti seni lukis, fashion, seni grafis, dan film. Dapat dikatakan bahwa aliran ini gabungan dari berbagai gaya dan gerakan pada awal abad ke-20, termasuk Konstruksionisme, Kubisme, Modernisme, Bauhaus, Art Nouveau, dan Futurisme. Popularitasnya memuncak pada 1920-an. Meskipun banyak gerakan desain mempunyai akar atau maksud politik atau filsafati, Art Deco murni bersifat dekoratif. Pada masa itu, gaya ini dianggap anggun, fungsional, dan ultra modern. Setelah Eksposisi Dunia 1900, berbagai seniman Perancis membentuk sebuah kolektif resmi, La Société des artistes décorateurs. Para pendirinya antara lain adalah Hector Guimard, Eugène Grasset, Raoul Lachenal, Paul Follot, Maurice Dufrene dan Emile Decour. Para seniman ini sangat mempengaruhi prinsip-prinsip Art Deco pada umumnya. Maksud perhimpunan ini adalah memperlihatkan tempat terkemuka dan evolusi seni dekoratif Perancis secara internasional. Wajarlah bila mereka mengorganisir Exposition Internationale des Arts Décoratifs et Industriels Modernes (Eksposisi Internasional untuk Seni Industri dan Dekoratif Modern) pada 1925, yang menampilkan seni dan kepentingan bisnis Perancis. Gerakan awal ini disebut Style Moderne. Istilah Art Deco diambil dari Eksposisi 1925, meskipun baru pada 1960-an istilah ini diciptakan, ketika terjadi kebangkitan kembali Art Deco. Aperture: A wall with windows sounds so banal. A mass punctuated with apertures seems formally intriguing. Hint: They’re the same thing. 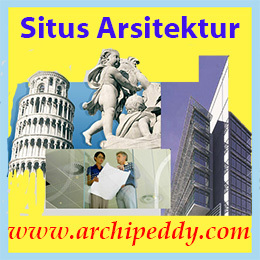 Architectonic: Even though the definition of tectonics already relates to building and construction – the science or art of constructing materials – architects like to include the prefix “archi” wherever possible just to make sure everyone knows that they are still important. Assemblage: a model of a design built of anything around. From the French, meaning putting things together. Avant-garde: design that is ahead of its time.